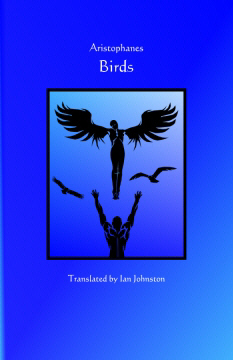 The Birds has long been hailed as one of the finest masterpieces written by Aristophanes (ca. 456 BC – ca. 386 BC), the greatest of all classical Athenian comic dramatists. First performed in 414 BC, at the height of the Peloponnesian War, which pitted Athens against Sparta, the play celebrates the extraordinary character of Athens in a manner that is at once robust, lyrical, satiric, and full of ironic resonance. In the play, two Athenians, Pisthetairos and Euelpides, seek to escape the aggressively quarrelsome climate of Athens by hiking up into the mountains to seek advice from the birds about where they might find a more peaceful place to live, a city where they can relax and enjoy life. But once they begin interacting with the birds, the Athenians cannot resist persuading the creatures to organize themselves into a city state, so that they can exert pressure on the gods above and men below in order to gain power over them (for example, by controlling the gods’ access to human beings). The impromptu scheme escalates, and by the end of the play, Pisthetairos has supplanted the gods and now rules everything, an occasion which they all celebrate by eating a meal of cooked birds. Much of the play is taken up with the bawdy, energetic, and inventive comedy familiar to readers of Aristophanes. But underlying the humor is an ironic exploration of the Athenian character, which is far too restless and acquisitive, far too in love with ambitious scheming and, above all, with language itself, so that it cannot resist taking control of each and every situation. Ian Johnston’s new translation, which stays close to Aristophanes’ text, captures the dramatic energy and the frequently shifting tone of the original play. The English text is immediately accessible and will be of particular interest to those interested in dramatic production. The translation also includes footnotes to assist readers with some of the more puzzling contemporary references.